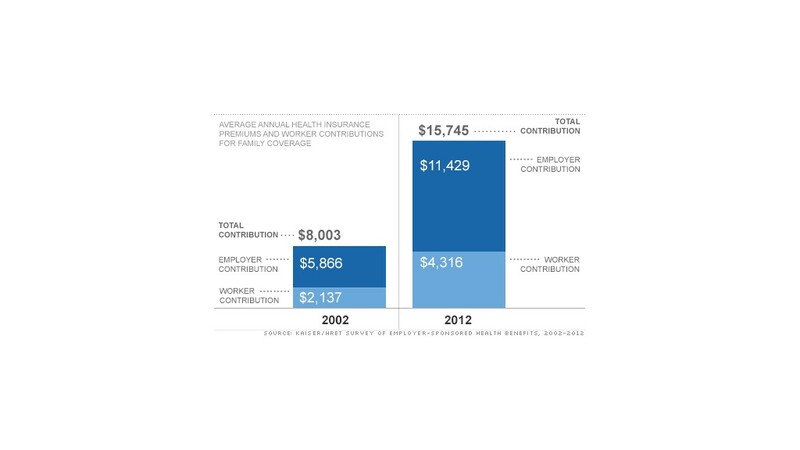 For insured workers, the cost of buying health insurance for a family of four increased 4% to $15,745 in 2012. The cost of employer-sponsored family health insurance premiums jumped again this year, but the rate at which they rose slowed to historic lows, according to a new survey Tuesday. For insured workers, the cost of buying health insurance for a family of four increased 4% to $15,745 in 2012, according to a survey conducted by Kaiser Family Foundation and the Health Research & Educational Trust. Last year, premiums leaped 9% from the year before. "These are strikingly low numbers to those of us who have been studying health costs for a long time," said Drew Altman, president of the Kaiser Family Foundation. "A 4% increase in health premiums is good news." Altman said there are several factors that could have led to the slowdown, including the economy's slow recovery. When people have less money to spend and wages are flat -- as they have been in recent years -- they avoid getting medical care. Compounding the issue is the rise of high-deductible plans and other forms of cost sharing, like co-pays, that cause families to pick up a larger percentage of the bill. "Health care use and the economy have always been closely tied, and my sense is that the recession and slow recovery are responsible for much of the recent health spending and premium trends," Altman said. While premiums appear to be improving, health care costs still weighed heavily on families. The report showed that premiums for family coverage outpaced both workers' wages and general inflation. In less than a decade, premiums have increased 97%, roughly three times as fast as wages and inflation. "It still takes a growing bite out of middle-class workers' wages, which have been flat or falling in real terms," Altman said. This burden was even harder to shoulder for lower-income families. At companies where at least 35% of workers earn $24,000 or less, employees paid an average of $1,000 more each year than workers at companies where at least 35% of employees earn $55,000 or more, the report found. And it's not just premiums. Lower-wage employees were also more likely to pay high deductibles. The survey found that 44% of workers at companies with many low-wage employees face an annual deductible of $1,000 or more, compared with 29% of those at companies with many high-wage workers. "This year's survey suggests that working families at the low end of the wage scale face significant out of pocket costs for coverage," said study lead author Gary Claxton in a statement. "Firms with many lower-wage workers ask employees to pay more out of pocket ... even though the coverage itself tends to be less comprehensive." Altman said he doesn't expect a return to double-digit increases in premiums anytime soon, especially as provisions from the Affordable Care Act kick in. Even though much of the health reform law won't go into effect until 2014, the report estimated that the number of young adults covered by employer plans increased to 2.9 million this year from 2.3 million in 2011, as a result of the provision that lets young adults stay on their parents' insurance plans until age 26. The 14th annual Kaiser survey was conducted between January and May 2012, and polled 3,326 small and large employers with three or more workers.